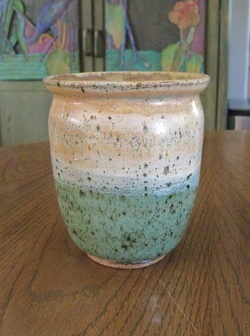 In 2010 my oldest daughter, Jenny, began taking pottery classes at the Hawaii Potters Guild. 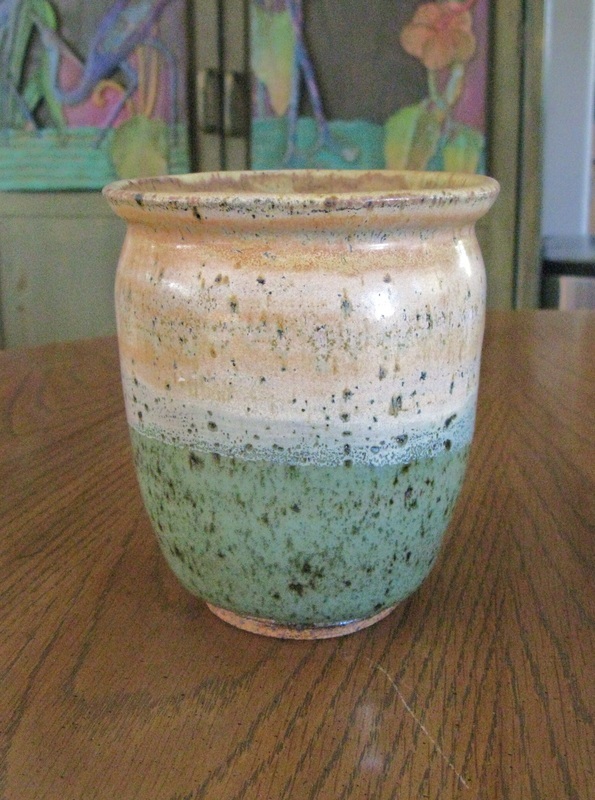 She had a knack for making pots and soon she was bringing home beautiful vases, bowls, plates, tumblers, and teapots. One of the ladies at the Guild was so impressed with Jenny's work that she gave Jenny her old Shimpo wheel to bring home. My daughter began encouraging me to take classes with her as well. She kept talking about how much fun she was having and about her wonderful teacher from Thailand, Supin Wongbusarakum. For a year and a half I kept saying "It sounds great but I'm pretty busy right now. Maybe things will work out next session." Then in December of 2011, she asked me again. But this time I thought, "You know, you're pretty lucky. How many 26 year old women want to hang out with their fathers?" So we signed up for a Friday morning class with Supin which started in January of 2012. At first my plans for having fun with clay, with making 20 lbs. of it pirouette on my wheel, turned into what looked like the attempts of a drunk man to corral 2 lbs. of it. Now it's true that the father-daughter thing was working out well. I was enjoying the hour before class, the hour I spent with Jenny at Glazers Coffee Shop a few blocks away, but the class itself had been frustrating and the idea that working with clay would be "fun" seemed misleading at best and dishonest at worst. So how did I go from being frustrated, ready to throw my clay against the wall, to becoming an enthusiastic potter? The process is alot like getting addicted to golf. When you first start golfing you're slicing, hooking and shanking balls all day long. You're cursing your balls, you're cursing your clubs, cursing the grass, and cursing the trees. You're ready to consign the whole course and golf itself to the second circle of hell when suddenly you hit The Shot. The club impacts the ball with a satisfying "ping." It sails straight ahead in a beautiful arc and lands softly on the green only four feet from the hole. "Hey, great shot," your brother-in-law says, "That's the best shot of the day." And that's how you get hooked. It feels great to hit a shot like that. You want to know where that shot came from and how to make that happen now and forevermore. Well, I felt that first sense of elation while working with clay toward the end of my first month of class. Like most beginning potters, I was having trouble getting that nasty little piece of clay to sit still. How could such a small thing be so hard to get on center? My daughter, Supin, and everyone else in class was giving me advice, often conflicting advice to my mind, about how to center my 2 lbs. of clay, but in spite of all their advice and my best efforts, my clay kept doing the shimmy all over my bat. And then on the fourth week it happened; the clay went still. I felt it before I saw it, and then I took my hands away slowly ("Easy on, easy off," I heard ringing in my ears), and the clay was spinning motionless. "Wow," I thought, "So that's what they're talking about when they say the clay is centered. I don't know exactly how I did it, but I think that's it!" With some trepidation I put my thumbs into the center and pushed down and out slowly, so slowly. "Look at that," I thought, "I've opened it up and it's not wobbling all over the place!" Then I tried to remember what to do next: "Okay, put the fingers of your left hand inside at the bottom and put the knuckle of your right hand outside at the bottom." When my hands were in position I began squeezing the clay and then pulling it up, up, up, lifting it higher and higher. The clay was levitating, gaining more and more altitude until it had soared up 3 inches. I didn't breathe during the whole pull, so I sat back to catch my breath and consider what had just happened. After a moment I thought, "Why chance another pull? I'll just make a bowl." But then I thought, "C'mon Jon, you don't want to make a bowl. You want to make a vase." So my shoulders hunched back over the wheel, my fingers assumed their original position vis a vis the clay, and began squeezing the clay and lifting it up again. When I was done with the second pull, I took the ruler out of my toolbox and noted with some satisfaction that the clay had elevated an entire inch, a gain of 33% on a single pull! I was elated but worried I was about to screw the whole thing up. "Better to stop while I'm ahead," I thought. "Better to make a cup or a mug than to risk failure and the loss of all I've gained." But then I found myself leaning forward, brooding over the clay and touching it again. Another pull, another inch. Five whole inches! I sat back to examine my work, the clay rising smoothly in a cylinder, towering over the plane of the wheel, and I thought "Now what?" I called over Supin, and she said "Why don't you just belly out the body a bit and give it a nice rim?" I looked back at my cylinder and thought "Why should I belly it out? Why don't I just cut it off the wheel right now? I bet it would look nice with some flowers in it." Then my inner artist began badgering me, "Are you kidding me? That's not the pot you want. You want something better. BETTER!!!" So I picked up my yellow rib from Mudtools which had never seen action until that day. Carefully, very carefully, I slid the rib inside the cylinder and just held it there, not daring to touch the walls that were spinning too quickly around it. "Jon, slow your wheel down," I heard Supin say, so I pulled out the rib, slowed the wheel down until it was hardly spinning at all, and put the rib back inside. Slowly, slowly, I pushed the rib into the side of the clay until the walls bowed out. "Okay, okay," I thought, "that's enough. Don't need to make the walls bulge out any more than that." Then to my horror I realized my pot had shrunk. Truly it must be smaller now and my ruler confirmed the ugly truth: my pot now stood a full inch shorter. Bellying out the walls even a little had lost me some altitude. It now stood a mere 4 inches tall. I took a deep breath and exhaled, shaking my head at the unfairness of it all. What the clay gave in one way it took back in another. "If I keep this up," I thought, "I won't end up with a vase. I'll end up with a toothpick holder." "What kind of rim are you going to put on it?" I heard Supin ask, and I turned my head to see that she was looking over my left shoulder. "I don't know," I said, "What do you suggest?" Then she put out two fingers and began working them up and down, back and forth and side to side while describing what she was doing with them. I must have been staring at her like an idiot because she finished by saying with a smile, "C'mon Jon, it's easy," and then spun around and walked away. "Easy, yeah, real easy," I muttered, "Easy when you've been throwing clay for 20 years." I looked around me and everyone else was pulling up 12-inch cylinders while they were chatting and laughing. They were chatting about their kids, chatting about movies, chatting about where to go for lunch, chatting, chatting, chatting and then it struck me that I'd hardly said a word in half an hour. For half an hour I'd been totally focused on building up my clay edifice one painstaking inch at a time. "I can't mess this pot up," I thought. "I've invested 30 minutes of my life in this pot." So with a prayer on my lips and perspiration on my forehead, I bent over the pot again with my trembling fingers pointing out like a divining rod. They touched the clay of the rim lightly, like the clay would shock me. Then gently the finger of my left hand began pushing the clay into the finger of my right hand, slowly, slowly bending it down. I let go and sat back, gazing at my creation with a critical eye. "No," I thought, "that rim isn't right. It needs to come down a little more." So I wet my fingers again, took a deep breath and began coaxing the clay to bend a little lower.... lower....... lower........ even lower.......... wait a minute, not too low, not too low, a little higher, a little higher, bring it back up up up! Whew, I almost blew it. Then I gently released the clay and sat back. "Hey Dad," I heard my daughter say, "That's a great pot!" "Yeah, it's my first one," I said with a smile and a sigh of relief. I didn't care that it was four inches high and the walls were half an inch thick. I'd just made my first pot and it felt good. At that moment I began to understand how much skill it takes to make a pot out of clay, and I felt a desire welling up inside of me to learn that skill. I wanted to learn a craft, the craft of potting. I'd always been a collector, and I'd always been interested in design. Now I could think about it from the other end, the end of those who design and make things. The whole experience of learning a skill would be more demanding than I expected. While potting I had to be focused, attentive to the clay, the wheel, to a hundred things that were happening all at the same time. I was learning things with both my body and my mind. Was the clay too soft? Was the wheel spinning too fast? Was a piece as good as I could make it, or did it need more work? I found the whole experience exhilarating. I had faced challenges and had met those challenges as well as I could, but I sensed there were greater challenges around the corner and I would need to get better to meet them. Pottery was going to be more than fun, but I wouldn't have known that until I touched my first piece of clay. I continue to relish the challenges of working with clay and continue to push myself to grow as a potter and to create better work.